Today civil activists, politicians and anti-corruption experts from around the world will meet in Kiev to assess Ukraine’s progress in fight against corruption and what more needs to be done. I won’t be one of the cheerleaders. Unfortunately, in the two years since what we call the Revolution of Dignity, corruption is still a key challenge in Ukraine, and any small progress that has been made has been because of the efforts of Ukrainian civil society, not the politicians. There have been some successes particularly in public procurement, teaching people how to report corruption and developing new legislation for political party financing. The government estimated that every year more than $2.3 billion is lost to corruption in public procurement. To limit this my organisation, Transparency International Ukraine has helped draft new procurement legislation and worked with the Ministry of the Economy and a team of volunteers to develop a new e-public procurement platform to pilot electronic tenders called ProZorro. In February this year 10 government agencies piloted ProZorro to issue 34 tenders worth 13 million Ukrainian Hryvnias (US$536,000). As of now there are more than 1,500 different departments issuing more than 21,100 tenders worth about 5 billion Hryvnias (US$214 million). There are too many negative connotations to the word whistleblower in Ukraine. That’s why we launched “They wouldn’t be silent” a year-long campaign started last April to change negative attitudes to those who speak out against corruption. 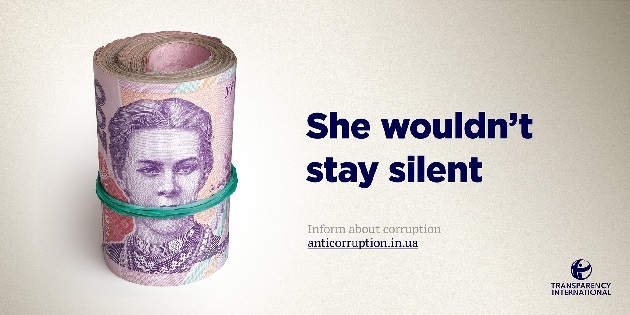 Billboards across the country showed famous Ukrainians, such as the poets Lesia Ukrainka and Taras Shevchenko, calling on people not to keep silent about corruption. There were also videos on national TV. Hundreds of people, many the victims of corruption, started calling us to report their experiences and seek advice via the website http://anticorruption.in.ua/. We received complaints about corruption in education, law enforcement, licensing bodies, local government, health care, and land registries: just about every public service that people encounter day to day. Experts also offered trainings and webinars across the country, teaching citizens how to use anti-corruption legislation and how to report on corruption. Political parties in Ukraine often become the tools of oligarchs and special interests because they are able to donate large sums to capture parliamentary seats. But now there is a new law, which civil society (TI Ukraine among others) helped draft, on political party financing that is supposed to enter into force in the middle of 2016. It mandates transparency in party funding and could see party leaders charged with criminal liability if they break the rules. The biggest challenge now is its implementation. The bad news, however, is real. Despite the fact that in October 2014 Ukraine adopted a package of six anti-corruption laws mainly to establish well-financed and independent institutions to fight corruption, little progress has been made. The National Agency for Prevention of Corruption (NAPC) and the National Anti-Corruption Bureau (NABU) have done little yet to earn the right to their names. Last summer TI Ukraine sued the Government of Ukraine to make it mandatory to elect transparently the authorities of the NAPC. We also launched a media campaign. We lost our civil action but the president and the prime minister did announce the re-launch of the NAPC. As a result, five leaders of the NAPC will be appointed this year, in November. All these delays are reflected on business climate. Ukrainian business says that corruption has not changed since the Yanukovych’s presidency. And it is because of the inaction of the Ukrainian authorities in bringing to book corrupt officials and implementing the new laws. Ukraine does have an investigative anti-corruption body which is highly motivated, has the necessary resources and has been trained by the best specialists of Europe and the USA, but they cannot start their work without the supervision of anti-corruption prosecutors. The process is slowed down by the Prosecutor General Viktor Shokin and his choice of prosecutors. These are all linked to the Yanukovych regime. Even the European Union has said it does not trust the process of formation of anti-corruption institutions because of this. So even after hundreds of deaths of Ukrainians during the Revolution of Dignity, even after thousands of deaths of the citizens as a result of a war with Russia, even after declarations about wanting a better standard of living for Ukrainians, the government still wants to enrich itself rather than tackle corruption. Ensure that when people blow the whistle on government corruption there is an effective feedback mechanism so the information is acted on. This is what the people stood in the streets for. This is what the people deserve.